The HP LaserJet 3050 is an affordable and compact all-in-one multifunctional printer that makes printing, faxing, colour scanning, and copying easy and dependable.The printer is compact and lightweight making it easier to move around. The printer has standalone faxing capabilities. Although colour faxing is not supported, fax standard is the latest Super G3 which offers a relatively fast 33.6Kbps transmission speed. 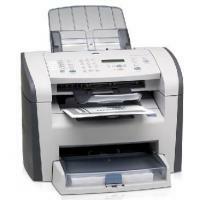 Standalone fax and photocopy controls are easy to operate and the useful features include auto redialing, delayed fax sending and broadcast transmission up to 119 stations. There is also a dedicated fax memory for storing up to 110 pages with a 30-sheet automatic document feeder that works precisely. On the quality front, the scanner is more than capable of document scanning and standalone photocopying but it can't compete dedicated photo scanners for sharpness or colour accuracy. With HP Laserjet 3050 toner cartridges, the quality of printing generated is crisp and sharp as one can expect.The printer is notably fast for its price as the pages come out within a few seconds even from power save mode. The HP LaserJet 3050 only has monochrome facilities. The era which is going full colour for almost all of its computing requirements, this will seem to overlook to many buyers. Using the printer with HP Laserjet 3050 toner cartridges can have a monthly volume of up to 7,000 pages which is more than enough for the average small business setting. If one is not concerned with scanning documents on a regular basis, the HP LaserJet 3050 is a very good way to merge all of the office's essential functions into a single machine. Q. Does this printer support faxing? A. Yes, this is an all-in-one multifunctional printer that supports printing, faxing, scanning and copying of documents. Q. What are the connectivity options available for HP Laserjet 3050 printer? A. The connection is possible through wired technology. HP Laserjet 3050 does not support wireless connectivity. Q. Will using the compatible HP Laserjet 3050 toner cartridges from your site can break my printer? A. Any type of cartridge, whether original or remanufactured, could cause damage to your printer. It is an extremely rare case, that compatible cartridge can break a printer. Take extreme care while installing the cartridges to ensure you do not damage your printer or cartridges. Q. What is the optical print resolution of this printer? A. The optical print resolution is 600 x 600 dpi. Q. Is HP Laserjet 3050 suitable for small office set up? A. The HP Laserjet 3050 is an affordable printer and is compact and light in weight making it easier to place anywhere in small office space and is comfortable to move around. This makes it an excellent option for a small office set up. The printer offers good productivity with its high-yield HP Laserjet 3050 toner cartridge. Compact in size this printer is perfect for handling business projects and weighs approx. 20.5 lbs and measures 16.9 x 17.4 x 18.1 in. Q. Are there any colour cartridges available for HP Laserjet 3050 printer? A. No, there are no colour cartridges available for HP Laserjet 3050 printer. It is a monochrome laser printer which can only print in black. Q. Are these compatible HP Laserjet 3050 toner cartridges original or remanufactured? A. The compatible toner cartridges supplied on our site are remanufactured cartridges that are well tested for high-quality performance and are ISO and FSC certified. The cartridges supplied are cheaper in price but provide good page yield as of the original ones. Q. How to make sure that your compatible HP Laserjet 3050 toner cartridges would work fine with my printer? A. Compatible cartridges work equally efficient as the original ones do. Ensure that the nozzle heads of your printer are clean so as to get clear prints. Before you start printing, do check the toner level in the cartridges. When all the conditions are appropriate, HP Laserjet 3050 toner cartridges would yield impressive and quality printouts. Q. Is HP Laserjet 3050 only compatible with Windows operating system or can I use it with other OS too? A. HP LaserJet 3050 is perfectly compatible with Windows XP and Mac OS X systems but is not compatible with Vista and or Windows 7, so you'll have to use a device with an older operating system to perform the basic functions. While shifting to other operating systems, ensure that you to install its respective drivers. Q. How many pages will these compatible HP Laserjet 3050 toner cartridges print? A. Our remanufactured toner cartridges are manufactured to ISO standard and therefore we expect these cartridges to print equal or more than the original ones. Practically, you can expect a monthly volume of up to 7,000 pages with these compatible cartridges. Q. How can I check the toner levels of the cartridges in my HP Laserjet 3050 printer? A. HP enables you to check the toner levels of the cartridges from the printer drivers properties from the desktop using HP status monitor. It is advisable to check the toner levels before printing to ensure consistent quality prints. Q. I want to buy HP Laserjet 3050 toner cartridges in bulk for my office in Ireland. Do you provide deliveries for bulk orders? If yes, then where can I find the information? A. You can always approach us with the bulk orders. We do provide deliveries for them. For checking on the stocks and further assistance, please feel free to call on 048 30833221.